Scotland is another country, according to the Evening Standard, the New York Times, the Guardian and half my Twitter stream. It is different from the rest of the UK and certainly different from England. When you look at the electoral map, it’s hard to argue with that. 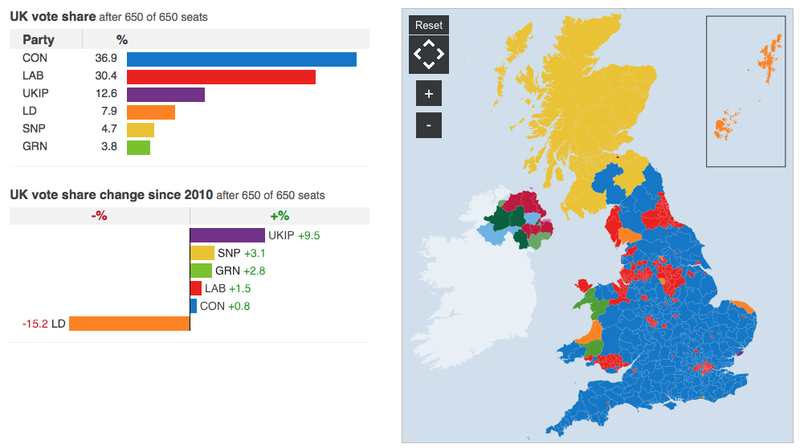 Then again, when you look at the electoral map, Scotland looks different from the rest of Europe too. In most of the world’s older democracies, the main political divide is between the conservative right and the liberal or social democratic left. The extent to which these parties dominate varies. In the US, no other parties get a look in but even in countries with more proportional systems and more parties, the two biggest ones are usually centre-left and centre-right. In the European Parliament, this pattern is replicated in the groupings of national parties. Regardless of their electoral systems, most countries in the developed world have a big red party and a big blue party. The Americans have the colours the other way round but the division is essentially the same. So what happened in Scotland? It seems to have neither. First to go was the big blue party. 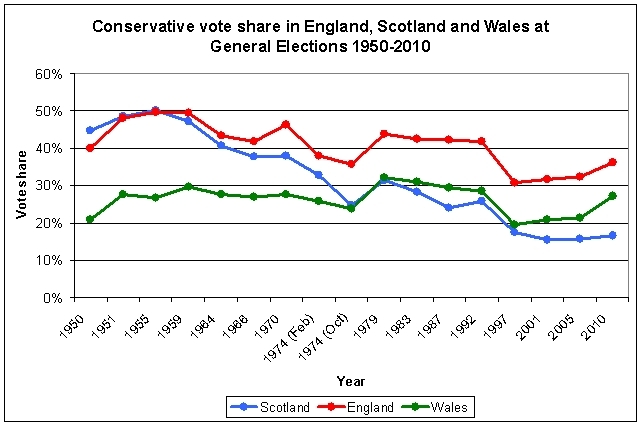 Scotland, more Conservative than the rest of the UK in the 1950s, had almost abandoned the party by the 2000s. Is this because Scotland has become a socialist or social democratic country? Could it really be that a country which, within living memory, was largely Conservative, has shifted irretrievably to the left and no longer has a right wing? If so, it would be unlike almost anywhere else. Where have Scotland’s conservatives gone? Some of Scottish Conservatism’s demise, says Nick Pearce, was due to a gradual decline in working class identification with Protestantism and the empire. [A]s the foremost historian of modern Scotland, Tom Devine, argued in his magisterial work The Scottish Nation (1700- 2007) the Conservative Party began to lose support in Scotland when its role as a Protestant party of the Union and Empire waned in the early 1960s. In 1964, it dropped the title Unionist, in favour of the anglicised Conservative. As Devine recounts, it steadily lost the skilled Protestant working class, as Britishness and sectarianism lost their appeal, while its Clydeside industrial class leaders were replaced by anglicised lairds and aristocrats. In other words, as Ian McWhirter says, the nature of Scottish patriotism has changed. Most countries have a patriotic right but in Scotland, Britishness and unionism have become less important to that sense of identity. At least some of the Scottish Tories, he says, turned into Scottish Nationalists. But how can that be? Isn’t the SNP left-wing? Not really, or at least, its economic policies are not. As the IFS said, its policies on public spending cuts are, if anything, slightly to the right of Labour. Until 2 months ago, the SNP was proposing cuts to corporation tax and, since 2010, it has cut NHS spending in real-terms. It is, says John McDermott, a lot less radical than you might think. It has its socially conservative wing too. Some of its members were bitterly opposed to gay marriage and a few of its MSPs voted against it. The SNP hasn’t moved that far to the left because, as Alex Massie says, a lot of its supporters are quite right-wing. This isn’t really surprising. Surveys of social attitudes keep showing that there is very little difference between Scotland and the rest of the UK. Like everywhere else, Scotland has its socialists, social democrats, economic and social liberals, fiscal and social conservatives, big staters and small staters. The only odd thing about Scotland is that all of these manage to co-exist within the SNP. Notwithstanding what I said earlier, there are some democracies where there isn’t a big red party and a big blue party. In a few cases, there is democratic one party rule. This is usually where, due to a liberation struggle or other national trauma, one party has become identified with the nation. Japan’s Liberal Democrats, Mexico’s Institutional Revolutionary Party, South Africa’s ANC and, closer to home, Ireland’s almost ideology-free Fianna Fail, dominated their countries for decades. Scotland now has the look of a liberation state. The SNP has pulled off that ‘we are the nation’ trick. As John McDermott says, “Scotland has become a democratic one-party state.” Like other national liberation parties, the SNP has subsumed divisions of class, religion and region into a sense of nationhood. This enables it to adopt an essentially centrist position while pulling in support from both left and right. The potency of Scottish nationalism is that it has combined a vision of Scotland’s alleged particularity (the besetting sin of all nationalisms) with a vision of deploying the co-dependency of private and public as the route to a fairer society and more dynamic economy. The Nationalists have got away with this because the other parties have let them. The Conservatives had enough votes in England for their demise in Scotland not to matter and Labour didn’t believe the SNP could annex its turf. Now, though, in their exasperation, both parties are colluding with the myth of Scottish exceptionalism and considering changing their names north of the border. If Scotland had completely different party names from England and Wales, that would only further emphasise the difference. Some Conservatives want to be shot of the whole place. Boris Johnson was talking about a federal state as the results of the election became clear. This is a formula for keeping the the flag, the submarine bases and the seat on the UN Security Council while limiting the influence the Scottish politics might have over the rest of the UK. Keeping the appearance of the Union while ring-fencing the Scots on their own reservation. But, while Scotland’s map shows an almost clean sweep for the SNP, much of this is due to our first past the post electoral system. The party’s support is distributed in the optimum way to deliver the most seats. It took fewer votes to elect an SNP MP than it did for any other party. 50 percent of the vote was enough to turn the map yellow. This map of second placed parties, produced by Crooked Timber, gives a glimpse of how Scotland used to vote. Peel away the SNP wallpaper and we see old Scotland, with its red central belt, Conservative south and north-east and Liberal highlands. While the SNP has conquered enough of Scotland’s political left, right and centre to give it the look of a one-party state, there is enough opposition left to suggest that it might be a bit early for the other parties to throw in their towels. Just because people voted SNP, says Gideon Rachman, it still doesn’t mean they want independence. Last week’s general election results, in which the SNP won all but three of Scotland’s 59 seats, has created the impression of an irresistible surge of support for independence. But, even now, only about half of Scots actually voted for the party. Expressing nationalist sentiment in a general election is a risk-free way of venting emotion. Voting for independence would be quite another matter since it would raise — once again — difficult questions about currency unions and tax revenues. It’s easy to emphasise difference. Talk to foreigners, though, and they will tell you how similar they think we all are. As Chris Deerin puts it, the same people but with different accents. The political map makes things look more different than they really are. There is nothing to suggest that Scotland is a different country other than the electoral performance, under a skewed system, of a party that has promoted that exceptionalism almost unchallenged. If it isn’t challenged, though, it will become true. If Scotland believes it is different it will eventually become different. The other parties seem to be accepting this almost without question. If they carry on like this, Scotland really will become another country. Jan Eichhorn of Edinburgh University shows that there has been no increase in feelings of an exclusively Scottish identity among people in Scotland. If anything, the reverse is true. 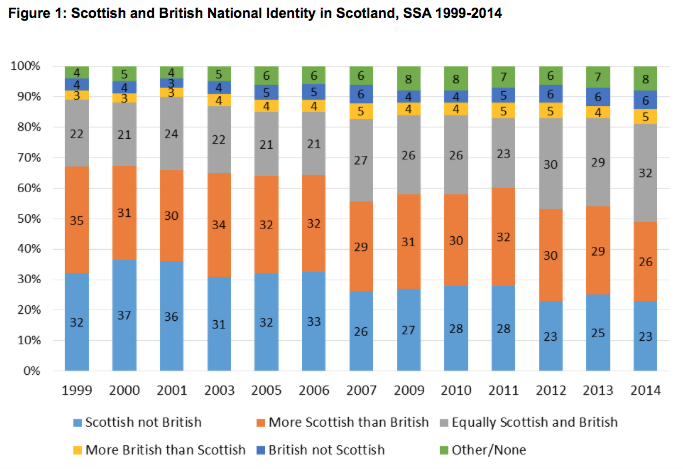 The proportion of Scots rejecting the British identity and seeing themselves only as Scots is lower now than it was a decade ago. The SNP’s victory cannot, therefore, be attributed to a rising sense of Scottishness as defined in opposition to the rest of the UK. To just make the point absolutely clear: Scottish identity or sentiment has not been increasing, but decreasing gradually since the advent of devolution. There has not been a higher relative level of emphasising Britishness in Scotland than in the year when the referendum on its independence was held. [T]his tells us an important message about SNP support: The SNP has not gained voters because it could increase the feeling of national identity, but has done so for other reasons. Crucially, commentators need to stop painting a picture in which the majority of Scotland predominantly base their political decision making mostly on their national identity. There has been no rise in nationalistic sentiment in Scotland. As we (amongst others) have repeatedly shown in our research, the strongest determinants of both independence and SNP support were pragmatic evaluations about economic prospects, trustworthiness and political personnel. For most people in Scotland the SNP is a normal party, that they like, hate or are indifferent to, but those evaluations for most are based on whether people agree with their policies and how they evaluate their representation. If commentators want to understand why the SNP is successful, they need to make a greater effort at properly understanding how public attitudes are formed in Scotland. Suggesting that it is down to sentiment is lazy at best, but actually misrepresenting the majority of Scottish voters. For political parties trying to challenge the SNP, first and foremost Scottish Labour, a similar message applies: to have a chance of engaging them successfully, they need to stop focusing mostly on high-level questions about different types of nationality. Instead they need to challenge the SNP on concrete policy debates around issues that affect people’s lives and which voters in Scotland are much more likely to base their votes on than identity-driven arguments. In other words, SNP support has very little to do with an increase in Scottish nationalism and a lot to do with the failure of the mainstream parties. If Scotland does become another country, it will not be because the SNP won it but because our political establishment lost it. 18 Responses to How different is Scotland? Really interesting post, Rick. Thank you! Perhaps SNP used to be more influenced by conservatives but dont think this is the case anymore. The increased membership of the party might make sure that they will probably stay left of Labour. Nearly 80K new members mean that they will be looking for all kinds of directions. They are discussing about Land Reform and changes to Renting/Property taxes. Does this sound like rightwing? Dont think so. Also the demise of Labour south of the border might also push more Labour voters into SNP. Finally it will be interesting to see how much of the SNP vote share will splinter off to Scottish Greens in the next elections. Land reform isn’t right-wing, but it isn’t left-wing either. It is the traditional cause of small-holder parties, which in Scotland used to mean the Liberals, and is thus small-c conservative (consider its social and political role in Irish history). What the SNP are proposing to do is disempower large landholders (some of whom are absentees in London, hence the emotional pull), however this is as much about bypassing planning laws for development (i.e. a neoliberal interest) as preserving crofter communities. Land reform is a common policy for clientelistic parties (see my separate comment below), though the results are that the best land, or most valuable development opportunities, tend to go to cronies or corporations, rather than the rural poor, while existing tenants are encouraged to see their rights as dependent on political fealty (you can see this happening in South Africa now). “They are discussing…”. So, not yet happened. How about considering their EIGHT YEAR record in power in Scotland? It shows them to be anything but progressive. Google the John McDermott FT piece that came out just before the election. He characterises their record in power as centrist, corporatist and authoritarian. Now what we need is an analysis of why the South, South West and East of England look so different from the rest of the country. Why do they vote so blue and purple? Do their attitudes differ fundamentally from the ‘rest of the UK’? We have to ask, as Scotland is devolved like Ulster, and will now get Devo Max, if the flat rate state pension NIL STATE PENSION FOR LIFE is imposed on Scotland as it is on England and Wales. Great Britain changed the law to introduce a new State Pension for men and women who will reach State Pension age on or after 6 April 2016. The changes to State Pension are not yet law in Northern Ireland. If the Northern Ireland Assembly passes similar legislation, these changes will be made in Northern Ireland. Chris, social security (sorry, “welfare”), including the state pension, is devolved to Northern Ireland but not Scotland. The devolution legislation requires NI to be part of a UK-wide social security system, and when the Assembly couldn’t agree on implementing “welfare reform” here it was subject to crippling fines from Westminster. I would agree with most of this, except “It took fewer votes to elect an SNP MP than it did for any other party. 50 percent of the vote was enough to turn the map yellow”. The link below shows that SNP achieved more votes per seat than any other party and no other party achieved 50% of the vote across all seats fielded. The Conservatives won with less than 37% of the vote. Actually, SNP took in more votes per seat they stood in than any other party. I know you like to look at the overall UK distribution but you have to look at how many seats they stood in for that stat to ring true. SNP only stood in 59 seats so actually took in 24651 for every seat they stood in, well above every other party in the UK. Plus if you consider the swings involved, record breaking swings, then this was a whitewash. Carmichael was also extremely lucky to hold his seat considering there was a 27% swing to SNP, just not quite enough. Stats can be looked at in different ways. The common feature of the “national parties” you list is less their role in their countries liberation or other trauma (the LDP was a bureaucratic merger of conservative parties in the mid-50s) and more their ability to command instrumental loyalty. They are essentially clientelistic, i.e. using local and national government power to allocate resources and favours to key electoral blocs and supporters. Presumably you omitted the Christian Democrats of Italy because their role in the liberation from Fascism was inferior to the Communist Party. As such, these are closer to the “machine” politics that characterised Scottish Labour. A structural explanation for the decline of Labour in Scotland is the gradual disempowerment of local government, started under Thatcher as a UK-wide programme but continued under Blair in the form of devolution and (within the 4 federal “states”) centralisation. Despite the flag-waving in St George’s Square, the creation of the Holyrood Parliament has shifted power from the Glasgow machine to the Edinburgh machine. As a coalition united by the pursuit and exercise of power, the SNP will seek to maximise devolved authority to Holyrood, but this will present challenges in terms of managing domestic expectations. Though they can use both the prospect of independence and opposition to the London government to maintain unity, “standing up for Scotland” must eventually give way to enacting domestic policies that will divide Scottish opinion. The contradictions, such as between condemning austerity and cutting corporation tax, will only become more pronounced. Equally, the graft and opportunism (e.g. cosying-up to Murdoch) will start to erode respect. The question for Scotland is what will happen first: will Labour revive or will the SNP split between left and right under the pressure of domestic politics? 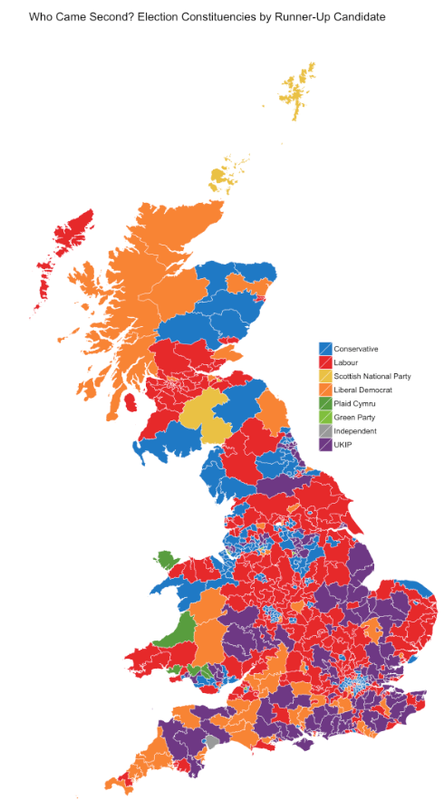 So the map of the second placed parties shows how Scotland used to vote? How revelatory. Interesting stuff. Its certainly an easier story for the media to polarise the difference – Scotland to the left, England to the right – when in reality social attitude surveys show that the difference is marginal. SNP policy seems to be more opportunistic and populist than genuinely left or right. Its worth mentioning though that Scotland has always had separate institutions that do define it as different. Even before devolution law, education, health, policing etc in Scotland were separate, so there’s a permanent, irreversible and increasing divide created by that reality. So even if attitudes remain the same and a sense of British nationality still exists, the desire to remain part of the UK is inevitably going to decline as Westminster becomes increasingly irrelevant to the lives of people in Scotland. Very interesting indeed. Let’s see what happens in the future. 2. The article does not appear to understand what “left wing” means in this context. The SNP is not left wing, in the sense that I understand that term. It self describes as social democratic, and that is precisely what it is. Those of us who genuinely want a left wing alternative are well aware that the SNP is not it. But I do not support the SNP for reasons of “patriotism”, nor because I believe them to be socialists: I am not patriotic in the slightest and have no respect for the concept at all: many do support the SNP for patriotic reasons: but not most of the people who voted for them in 2015, IMHO. The reason they garnered so much support is far, far simpler. Scottish people generally (with all the usual caveats about making sweeping statements) are looking for a return to the post war consensus. That is what the SNP offer, and that is what people like. The post war consensus did not deny that there are opposed interests in society. Quite the contrary. It did not pretend that “we are all on the same side” in its many variants. That is always and everywhere a right wing lie, and it is a lie designed to further the power of the elite. After the war there was a recognition that we genuinely do have opposed interests, and that if we are to make a decent society we must all compromise. No class or interest group can get all it wants, and the trick is to find a balance we can all live with. The “consensus” is a misleading term: It did not refer to a situation in which we all wanted the same things; rather to one in which we agreed that we could not have what we wanted, and acted accordingly for the greater good. That obtained throughout the UK from 1945 until the late 1970’s. I think it obtained all over europe, and lasted rather longer there, though it is steadily eroded by the neoliberal advance. 3. The tory party lost support in Scotland largely from 1979. That is when the great divergence from english voting patterns happened, as the graph shows. It is true it was diverging before that; but not much. It so happens that from about the mid 1970’s the post war consensus broke down, and the neoliberals replaced the “one nation tories” who had understood the need for and nature of that consensus. That is no surprise: laissez faire capital is always waiting in the wings and retreats when it must as a tactic: but never dies. It takes its opportunities when it can: it is the nature of the beast. But in Scotland the neoliberal version of the tory party was not accepted as it was in england; scots remained social democrats in favour of that consensual politics embodied after the war. As it happens I believe that that aspiration is also the aspiration of a great many in england. I do not believe the values have changed all that much, though more than in Scotland. I notice that the rhetoric has not changed enormously, though the practice of politics is radically different. Watch what they do, not what they say. Yet it is telling that words still pay lip service to that consensus even after decades of relentless narrative promoting a very different vision. 5. There is no comparable comparative graph for labour support over the period and that is unfortunate. But I believe that it would show that support for labour in Scotland has declined compared to that in england from 1997, when the labour party overtly adopted neoliberal policy and values. It took a lot longer for two reasons; tribal/sentimental attachment to the party’s history: and lack of an alternative which accounts for the decline in voter participation, imo. 6. The SNP have given the scots an alternative and that has led to strong engagement, reversing the decline which is lazily attributed to “apathy” in the media and by politicians. That merely absolves them of any responsibility for what they claim bothers them. The recent experience in scotland demonstrates that this is not apathy: it is realism. It goes away when the voter believes they can make a difference. 7. I do not know anyone who believes the SNP is the nation, though no doubt some do. I do not know anyone who believes that after independence the SNP will remain dominant on the political scene in Scotland. To suggest that this is a “liberation” phenomenon which will lead to a democratic one party state is frankly laughable. Nor is the assertion that it took fewer votes to elect an SNP politician than any other kind true: much less significant. In the same vein the observation that “50 percent of the vote was enough to turn the map yellow.” of any relevance at all that I can see. SNP worked under the same conditions as every other party and 50% is remarkable anywhere in the UK. But again the argument is odd: we have a one party democratic state where 50% of the people did not vote for that party: how can you hold those two ideas in your head at the one time? But the article is incoherent tosh, for the most part. For many of us this is not about Scottishness: it is about the kind of society we wish to live in. The one party state is the UK. They should look to it.